Brand's InnerShine Marine Collagen Essence Strip Review: Does It Work? Brand's, the maker of Essence of Chicken and Bird's Nest supplements, has branched out from just its staples of chicken essence and the like to include more beauty-related products with their "InnerShine" line. The Marine Collagen Essence Strip is just one of them; the company also has a Innershine Berry Essence and newer, heavily-promoted Innershine RubyCollagen Essence. But it's never too late to review a product as interesting as this one, surely! Brand's Innershine Marine Collagen Essence Strip: Collagen, Niacinamide, and Vitamin E.
Interesting because, like most other ingestible collagen supplements, Brand's claims that its product "supplies skin with collagen, Niacinamide (a form of Vitamin B3), and Vitamin E to maintain its suppleness and elasticity." It also is "a delicious, low calorie beauty supplement in jelly format" and they recommend that you take it twice a day, "once in the morning with your daytime skincare regimen and once more in the evening with your nighttime skincare regimen". Some very impressive claims! 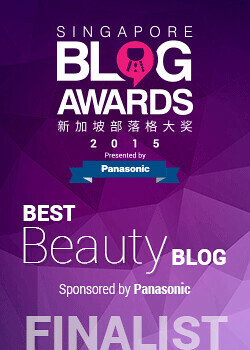 And, if you've been reading other beauty blogs, you'll see that pretty much all of them have raved and written lots of positive things about the product. Sounds good, right? 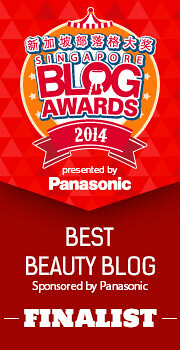 So how does the Brand's Marine Collagen Essence Strip hold up to its claim? Well, it is indeed low calorie (12 calories a stick, woohoo!). And yes, it is indeed delicious. The look and taste of this seriously reminds me of grape jelly! It tastes like grape jelly, is squishy and looks like grape jelly, and smells and feels like grape jelly! 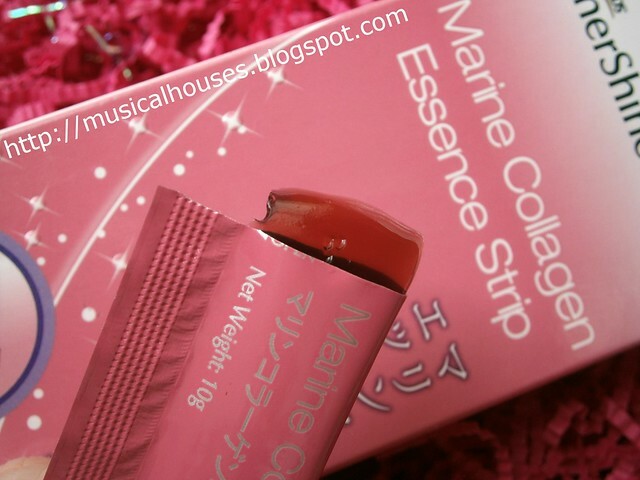 You know, jelly cups were very much a favourite treat of mine when I was a kid, so I really really dig that the Brand's Marine Collagen Essence Strip tastes just like that! But for the last claim - "supplies skin with collagen, Niacinamide (a form of Vitamin B3), and Vitamin E to maintain its suppleness and elasticity", does it really do as promised? Here's where I am a little skeptical. Brand's notes that "each strip contains Marine Fish Collagen 1,000mg, Vitamin E 3IU, Vitamin B3 4mg", so they do have the various components advertised in each strip. So as far as advertising goes, you can't say that it's dishonest. But, there is a big difference between eating a collagen-containing strip, and having that same collagen end up on your skin. Like I wrote in my post asking whether collagen supplements and skincare really work, collagen, once ingested, does not remain as collagen but gets broken down into amino acids. 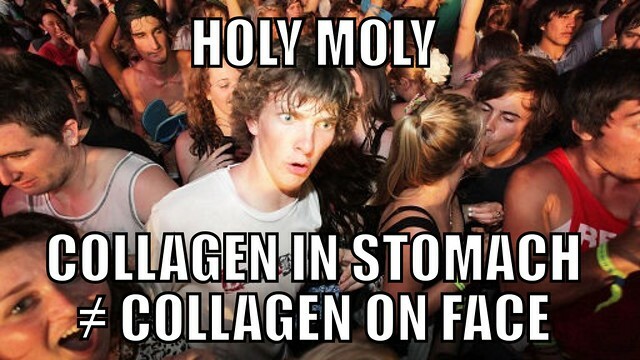 This is because collagen is a type of protein, and all proteins are composed of amino acids. Proteins are large molecules and aren't absorbed wholesale by your small intestines, so all of them (collagen and other proteins) go through this digestion process. Amino acids are used in various components of our bodies, so it's hard for us to guess where any amino acids from collagen will end up - probably in different components all over your body, or even in your urine as a waste product (although the last one is quite rare since our kidneys do a pretty efficient job at filtering out the useful amino acids from our pee). So unfortunately, they don't quite go from your stomach to your skin. Other than marketing goop from PR firms, I've yet to see any reliable information indicating otherwise. Also, if you read my post on the efficiency of collagen supplements and skincare, you'll notice that I wrote that hydrolyzed collagen was none other than gelatin - yes, the key ingredient of those jelly cups I loved as a kid. No wonder the Brand's Marine Collagen Essence Strip tastes exactly like those jelly cups - my guess is that this is really the key ingredient in the Marine Collagen Essence Strip. 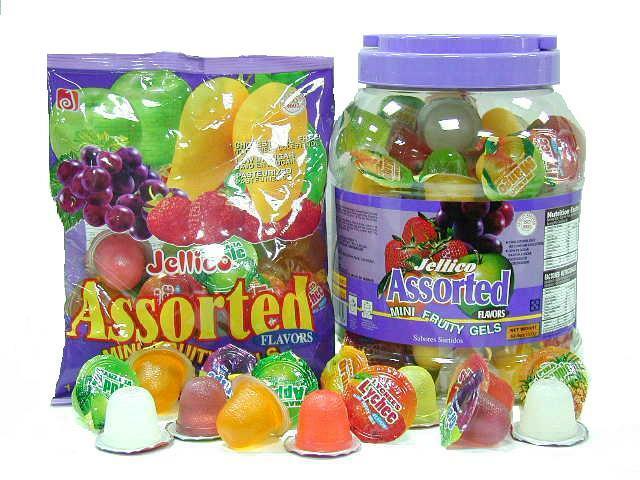 Sure, the gelatin source could be "derived from deep sea fish" as the company claims, but at the end of the day, I'd be willing to bet that the ingredients list will probably be something like this: Water, gelatin, grape extract, etc. I wouldn't actually know, because the brand doesn't list the ingredients on their packaging - the ingredients list merely restates the "each strip contains Marine Fish Collagen 1,000mg, Vitamin E 3IU, Vitamin B3 4mg" claim, but that's really nutritional information, not a list of ingredients. To elaborate, if you were a manufacturer of tomato ketchup, you'd put on the label two sets of info: "Sodium 160mg, Carb 4g, of which Sugars 4g" and so on; and "Tomato concentrate, Distilled vinegar, High fructose corn syrup", etc. The first is nutritional information, the second is ingredients. They're two different things. 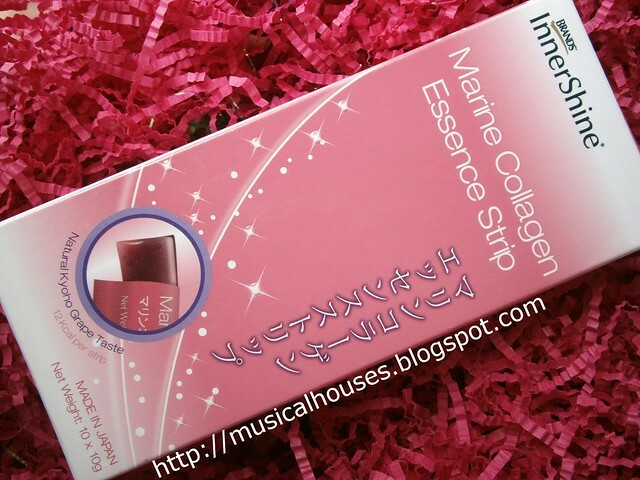 Brand's InnerShine Marine Collagen Essence Strip: Yummy, but I'm not sure what the ingredients are. Anyway, being the good, hardworking blogger that I am, I did contact Brand's via Facebook asking for the ingredients list, and although they got back to me in a prompt and friendly manner (good job, whoever is managing the FB page), and what they told me was, "The 3 active ingredients listed on the product pack (i.e. Marine Fish Collagen 1,000mg, Vitamin E 3IU and Vitamin B3 4mg) are compliant with the Health Sciences Authority's (HSA) ingredient regulation and pack declaration." Fair enough, but I guess this means we'll never know whether this was just mostly gelatin. I'll admit though, it does taste and feel like it. Honestly, if you were to blind me, and cut up a jelly cup and an Innershine strip into small cubes and asked me to differentiate which was which, I probably couldn't tell the difference. Sudden Clarity Clarence has also just had an epiphany. So. Let's cut to the chase. Would I recommend this product? Well, although all the other blogposts I've read have nothing but positive raves about the product, I have some reservations, because I'm not sure how much collagen you eat will land on your face. But otherwise, I have nothing against this product, and it's certainly not going to bring about any ill effects if you eat it. It's delicious (if you like jelly - but come on, who doesn't like jelly? ), convenient to tote around, and non-fattening, and hey, it even comes in the cutest pink box ever. If you snack on it, it is probably better for you than potato chips and biscuits, and other junk that we often eat to perk ourselves up on a slow day. 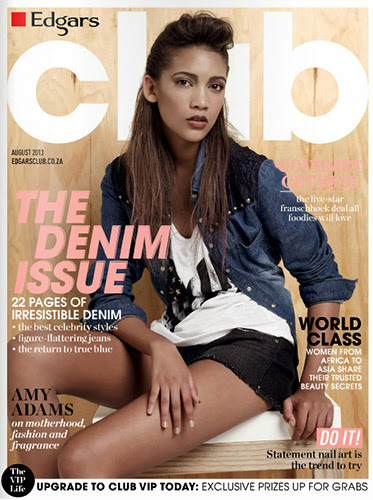 There are many reasons to buy this, just perhaps not so much for the skincare claims. I agree thank you! This post reiterated my newfound love of your honest insightful blog. Wish others would have the tenacity to dig a little deeper into prouducts especially the ones sent for review consideration. I think one box of this Brand's Innershine Collagen Essence strip cost nearly $30. I might as well take that amount of $$ & buy usual or no-sugar-added jelly cups which essentially contains also hydrolysed collagen i.e. gelatin, despite from another source (most probably bovine), but once ingested & broken down into amino acids, makes no difference whatsoever. I'm not sure if I should laugh or cry after reading your blogposts - I've been desparately trying to bring some reparative measures to my sudden and fat deteriorating skin: I'm 38 but feel like 68 o_0 and look at my lil' girl's skin with part envy part horror that my skin went from that to mine! Well.. not quite, but you get my drift. So... I went and got collagen this and that thinking hydrolysed whatever makes good sense compared to topical application which to my mind didn't make sense. In a nutshell, I don't know if any of those drinks helps... but a particular brand of 'collagen/hyaluronic acid/shark cartilege' supplement that I was taking for about 2months, suddenly showed great results! Not on my face I'm afraid... more on my nails! I was starting to think it wasn't working and then voila! I suddenly noticed that my peeling, cracking, splitting and constantly bending backwards nails were strong, smooth and completely held its own when pressure was put on them. 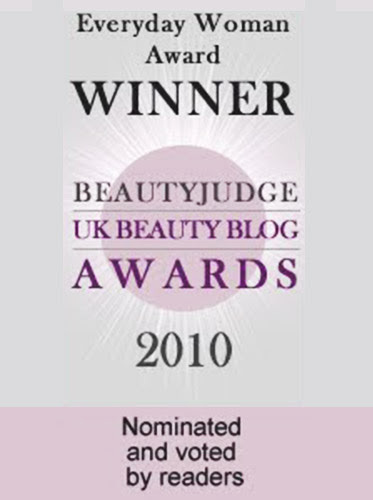 1) this particular "collagen, hyaluronic acid etc" supplement - maybe worked on cartilege and nails rather than skin? I'm kinda pleased and relieved with the success at least in the nail department I'm wondering if I should stop..?? 3) Do you have anything or insight on the consumption of hyaluronic acid other than the topical application? Would really appreciate your experience and knowledge on this area to shed some light on all these marketing pitches. Finally thank you so much for your time and effort! I believe I've learnt so much more going through your blog posts than doing google searches...!